Before Leaving - Acrylic with Pastel Markings - 40" x 38"
Opening exhibition Martha's Vineyard Museum, new museum space in Vineyard Haven, Martha's Vineyard, MA. Carol Hanisch’s 1969 essay, The Personal is Political, crystallized the slogan and the concept for American society. A critique of what came to be called “consciousness raising groups,” Hanisch’s essay title was already a phrase used by activist feminists in the 1960s as they formed discussion groups to come to terms with discrimination in their daily lives. Today the slogan, “The Personal is Political,” gains new power as we examine its meaning in the spotlight of the #MeToo movement. This group exhibition by the National Association of Women Artist MA was curated by Carolyn Wirth, Hess Gallery Director. The twenty-five works of art interpret the essay and women’s voices in today’s political climate. Some new work will be shown at a Featured Artist Exhibition at the Paula Estey Gallery. Thursday October, 25, A Paula Estey Super Club Event 6:30-8:30 tickets available at brown paper tickets here. 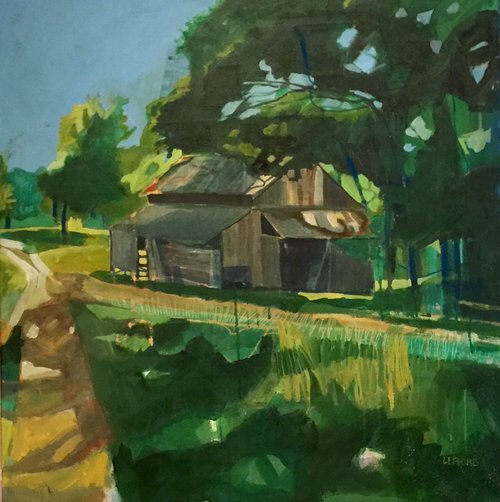 Georgia On My Mind - Acrylic with pastel markings - 36" x35"
Greenbelt's 29th Art in the Barn will be held June 8-10, 2018. Over 150 artists participate in the show including painters, potters, woodworkers, sculptors, jewelers and more. Join us on Friday evening from 5-8:30pm for live music by EJ Oulette & Crazy Maggy, food by Lexie's Burger Bus, and beverages provided by Ipswich Ale and Mill River Winery. Learn more at ecga.org/artinthebarn. Art in the Barn is a popular fundraising event for Greenbelt, a nonprofit land trust dedicated to protecting the open space of Essex County. Over the course of our over 50-year history, we have conserved more than 17,000 acres of land of farmland, wildlife habitat, and scenic landscapes throughout the region. New barn paintings will be in a group exhibition: “Everything That Grows” opens Friday, April 20, 2018, 12-5pm. The public is cordially invited to the “Night Before ArtWalk Party”, from 6-8:30pm. ArtWalk 4/21/2018, 11-6pm. Contact: Paula Estey at paula.estey@yahoo.com or 978-376-4746 for images and lots more information. “RADAR” is our awareness of the many dimensions of climate change, from the past to the current day, and as well as what we may expect in the future as we confront the realities of this life-changing issue. A visual interpretation of how humans are using up the world's resources. No Exit - Acrylic with Pastel Markings - 28"x 20"
Juried by David Thomson and Tameka Eastman-Coburn (Gallery Director) of @artlery160 gallery. Opening Reception: Saturday, February 17, noon-6p.m. The Last Mud Season - Acrylic with Pastel 24" x 21"
Despite the fact that women earn half the MFA degrees in the country, only a quarter of the exhibitions in New York galleries feature women and only 5% of art on display in U.S. museums was made by women (Carol Pelletier, Breaking Ground). With Our Eyes Open reflects on the state of women’s voices in the Arts in 2017 by bringing together two institutions founded to provide preparation and platforms for women— The Cambridge School of Weston (originally, The Cambridge School for Girls) and The National Association of Women Artists, NAWA, (originally, the Women’s Art Club). With eyes on progressive principles, both institutions were created to provide women with opportunities for their voices to flourish in a cultural atmosphere of inequality. With Our Eyes Open is juried and curated by Todd Bartel, Gallery Director at Thompson Gallery, the Cambridge School of Weston. Island Scape - Acrylic with Pastel - 20" x 30"
Reception Sunday August 6, 4-7p.m. Sail On Silver Girl - Acrylic with Pastel - 33" x 39"
This exhibition is a visual interpretation of Maya Angelou's poem titled "Phenomenal Woman". It's theme reflects on feminine nature - strong, beautiful, proud, and self-sufficient. 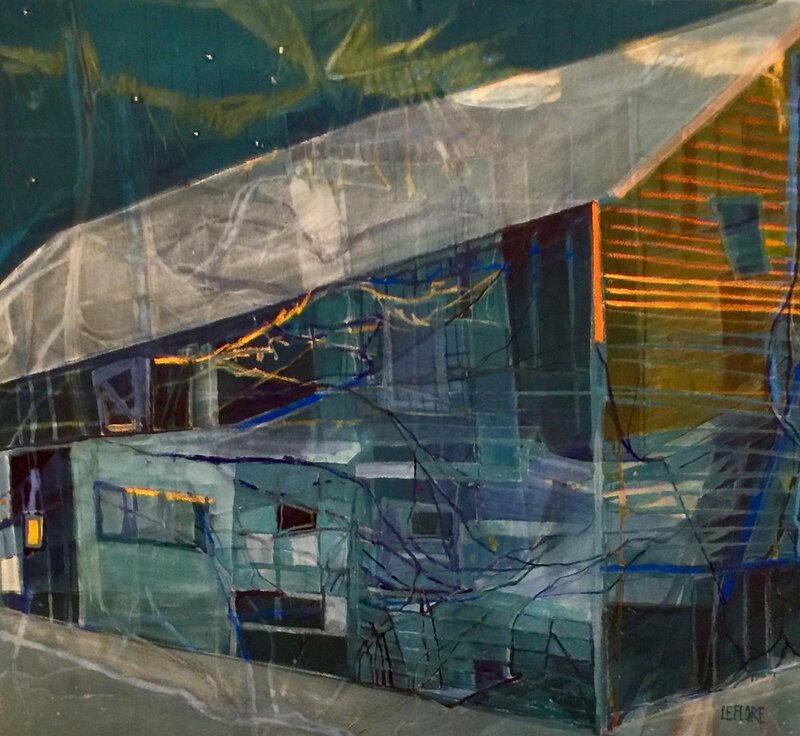 Good Night Barn - Acrylic - 31" x 28"
Annual Open Regional Juried Show: Reception Saturday, July 8, 5-7:30p.m. Juror: Andres Verzosa, former Interim Executive Director and Curator at the Ogunquit Museum of American Art (OMAA) and former owner of Aucocisco Galleries in Portland, Maine. 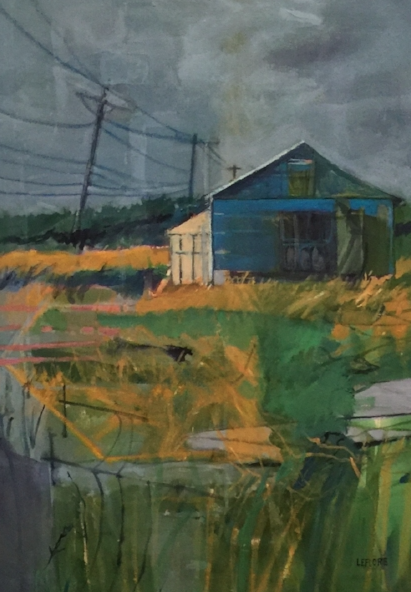 ART TRANSFORMS THE COX RESERVATION BARNS AND GROUNDS INTO AN EXCITING WEEKEND-LONG ART EXHIBITION AND SALE. PROCEEDS BENEFIT GREENBELT’S LOCAL LAND CONSERVATION EFFORTS. Redoux Acrylic with Pastel 40" x 30"
"Upward Trend" is a visual interpretation of global phenomena created predominantly by burning fossil fuels: sea level rise, ice mass loss, shifts in flower/plant blooming cycles, and extreme weather events. A discussion and reading from The Last Daughter of Elizabeth Light will focus on how the research of my family history led to writing a fictional family saga. As the novel works backward from Lizzie Kurtz, a modern woman, to her family’s connection to Mary Wollstonecraft and the women’s rights movement of the late 1700s, it reveals the indelible impression left on each generation by the one before it. These eight women and one man are inexorably connected by more than just a bloodline. Reception Saturday, November 5, 7-9p.m. Keizergracht - Acrylic with Pastel 30" x 30"
For this exhibit, 3S is partnering with Long Island based artist, critic and curator Christopher French to select the strongest sampling of contemporary visual artists from our region.